Babcock is pioneering leading edge engineering services using LiFi. For more than a century, Babcock has been trusted to deliver bespoke, highly-skilled engineering services. It helps customers in the UK and around the world to improve the capability, reliability and availability of their most critical assets within the four market sectors of Marine, Land, Aviation, and Nuclear, underpinned by a deep understanding of technology integration, unique infrastructure, and specialist training. In January 2017 Babcock set out to test new cutting-edge ways to support their customers. Babcock has established a smart Connected Facility test bed at its Devonport Dockyard in Plymouth. The purpose of this facility is to test and evaluate a number of leading technologies that will allow it to develop new operating models based on the use of digital data. The Connected Facility is being used to demonstrate how smart wireless sensoring and condition based monitoring systems might provide benefit to its maintenance programme and drive benefit into the business both in terms of cost savings and increased asset availability. Currently, the use of wireless sensors using radio frequency (RF) enabled sensors can represent a challenge as RF transmission can be subject to interference, security risks and can be unreliable. In order to understand its options for future wireless communications that are reliable, secure and non-interfering , Babcock is evaluating the application of new wireless opportunities to ensure that Babcock and ultimately its customers can ride the technology wave while operating under safe and secure conditions required in this sensitive environment. Light fidelity (LiFi) technology is a natural fit for such critical use case. pureLiFi began working with Babcock in early 2017 to demonstrate ground-breaking wireless connectivity solutions within their Devonport Connected Facility. Over a period of 4 weeks, pureLiFi installed and demonstrated the use of a LiFi network that consisted of a series of LED luminaires that provide light and data within the building. 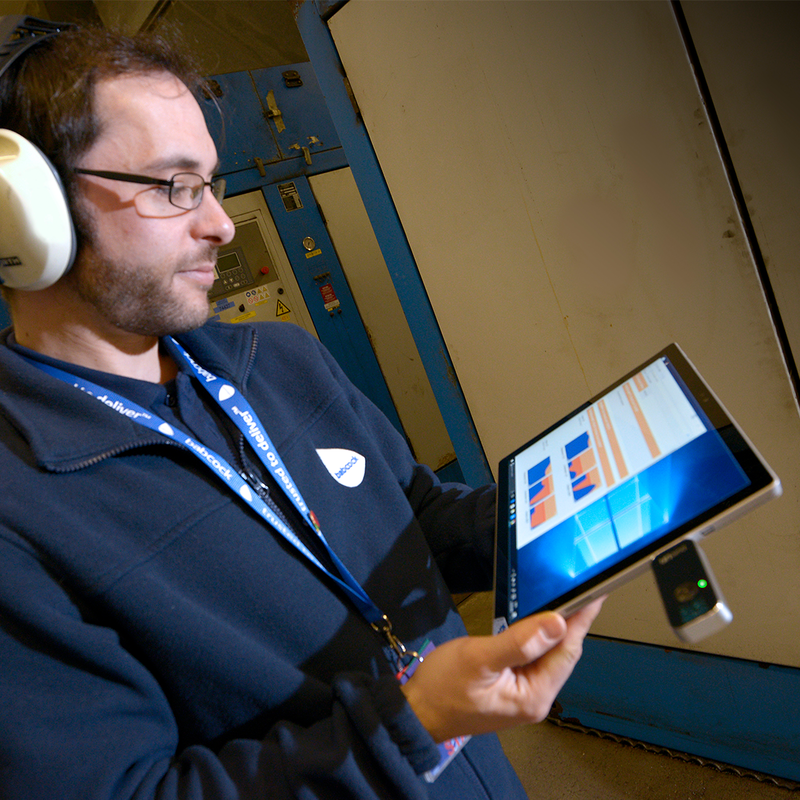 Using pureLiFi’s LiFi-X system they are now able to wirelessly transmit to and gather information from a range of LiFi connected vibrations sensors sited on six low-pressure air compressors. The implementation of this cutting edge remote communication technology in a live facility allows engineers to gather responsive and secure sensor information that was previously unattainable. The sensor information delivered by the LiFi system consistently and reliably transmits an array of vibration data to a server and smart screen such that the data can be visualised and new insight into material condition understood Babcock has additionally been utilising the installed LiFi network to connect to a LiFi enabled windows tablet to access support and maintenance information such as user manuals, work instructions and 3D models at the point of need. The pureLiFi system provides live data with a greater degree of security and reliability to the fingertips of engineers and algorithms to enable better anticipation and plan maintenance interventions only when needed, driving costs down and delivering a greatly enhanced service. Using groundbreaking technologies Babcock continually explores ways to future-proof the delivery of through life management of its own and its customer’s critical assets The secure, safe and non-interfering nature of the LiFi system means quick and easy deployment with minimal impact on the overall risk to the host asset. By focusing on the future with LiFi and developing solutions that have an impact today and in years to come, Babcock’s vision of engineering intelligence is a tangible reality.